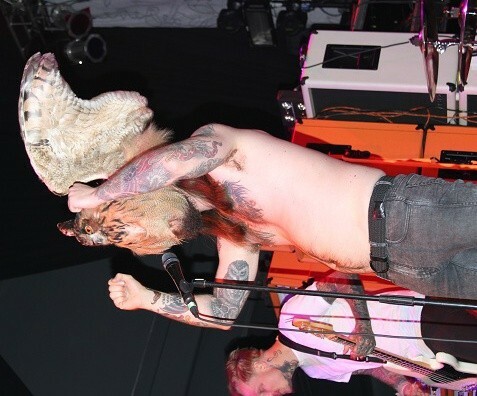 I arrived at the Depot just as the first opener Kvelertak took to the stage. I was swiftly escorted up the stairs and then to the stage by an employee. “Are you ready? Follow me.” The loud chant of guitars and drums welcomed me to the front of the stage. 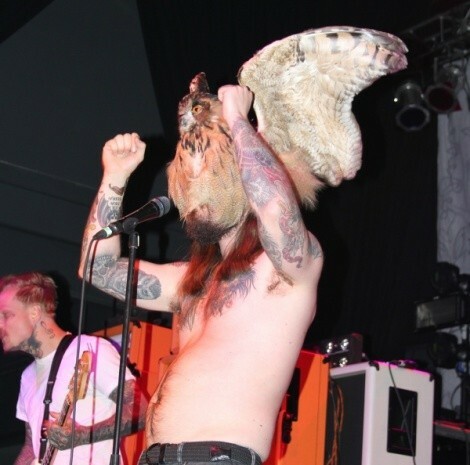 I looked up in awe at Kvelertak’s lead singer, Erlend Hjelvik, standing there with arms raised and a taxidermied owl on his head. After dodging Hjelvik’s spit bombs, I sat back and enjoyed the Norwegian metal. Kvelertak means “stranglehold” in Norwegian, and their Facebook page states “They are a band from Norway that plays rock music.” And play rock music they did, impressively well. With a charismatic front man and catchy tunes, it was a hell of a start to the show. The breaks between sets were perfectly timed. Not too long to stand around, but just enough time to grab a beer upstairs or a smoke outside. When Gojira took the stage, the crowd cheered as if they were the ones we’d all been waiting for. I could hear Gojira start their set as if introducing themselves to Salt Lake City for the first time. Gojira is a French band who takes their name from that Japanese monster we all know and love: Godzilla. Just like a monster, their French metal ripped loud and fast through the Depot. The stage lights were equally impressive, swooping through the room to the tempo. I stared out a window on the third floor, drinking a beer with a perfect view of the Mormon temple. I found it to be an interesting juxtaposition, considering the blackness of the metal and the whiteness of the temple. There’s a metaphor there, but I can’t find it. At the end of their set, Gojira came back after a raucous chanting of their name. Lead singer Joe Duplantier sincerely thanked the crowd, as if he was so surprised that they would have this amount of welcoming fans in the state of Utah. They then graciously rocked out to a few more songs before calling it a night. 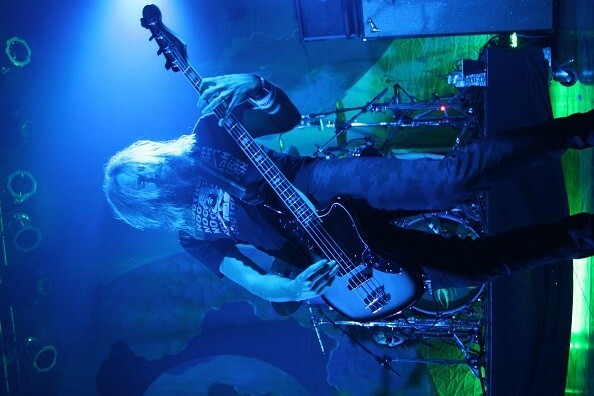 Mastodon came onstage like the strong silent type. 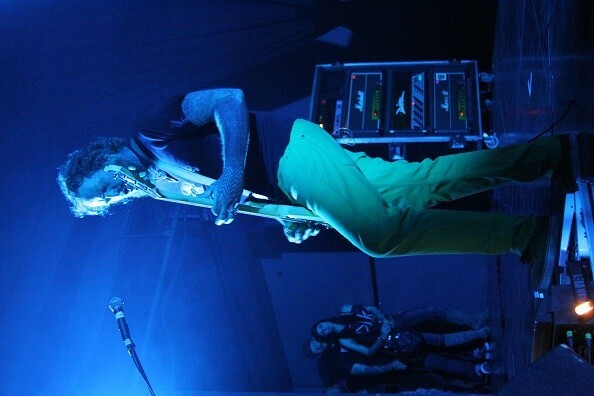 Stoic Brent Hinds and the band started the show off with “Hearts Alive,” the 13-minute epic from 2004’s Leviathan. A 13-minute song as an opening could possibly lose some people, but not when you’re a band that spins highly conceptual albums effortlessly. After that they jumped right into “Divinations,” which had me hooked from those unmistakable opening guitar riffs and vocals. Like they say, “No escape, fighting spirits.” You’re in for a great show! Toward the end, they graced the crowd with a new song, “High Road,” which is featured on their upcoming summer release, Once More ‘Round the Sun. Brent Hinds brought out his Flying V guitar for this one, and it was a surprise that the lyrics to this new song were already being sung with precision by the fans. At the end, Mastodon drummer Brann Dailor addressed the fans with a handful of drumsticks. He was impressed with the turnout for a metal show, on a Sunday night, in Salt Lake City, Utah. Saying they’ll be back soon on tour for their new album, he threw about eight drumsticks into the crowd for some lucky fans.